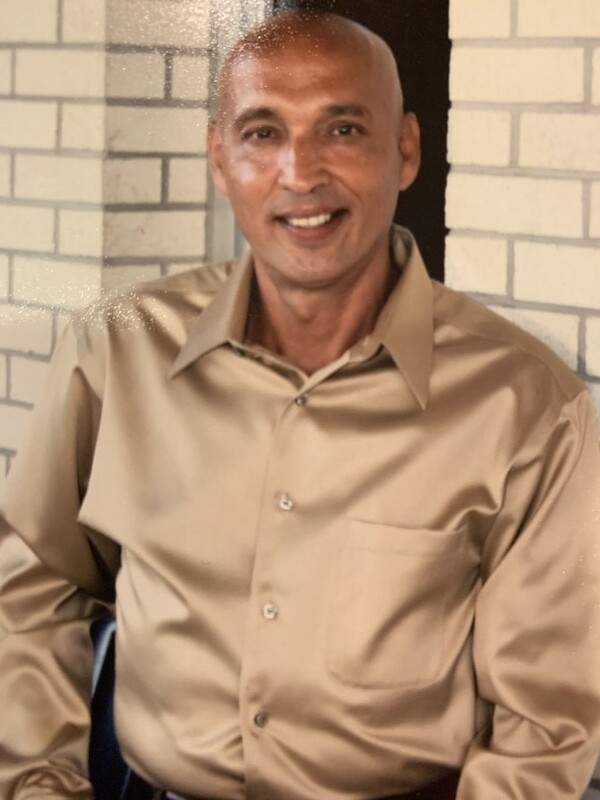 Gustavo Garcia 58, of Vincennes, Indiana joined his Lord and Savior on Friday, February 8, 2019 in Evansville, Indiana with his family by his side. He was born on June 11, 1960, in Elwood, Indiana, son of Luis and Magdalena Garcia of Pharr, Texas. He was a graduate of Lincoln High School and Vincennes University in Vincennes, Indiana. He was an Army Veteran. He was a Disabled Veterans Outreach Program Specialist at WorkOne Southwest and a CNA at Gentle Care both in Vincennes, Indiana. He is preceeded in death by his father Luis Garcia and niece Glenda Capozella. He is survived by his loving pet companion Daisy Mae, his mother Magdalena Garcia, Brothers; Luis Garcia Jr., Victor Garcia, Eduardo Garcia, David Garcia, Alejandro Garcia, Rafael Garcia (Brenda) and Ray Bernal (Jill) and Sisters; Anita Ryan (Richard), Purisima Lopez (Javier), Rosa Maria Garza, Maggie McNair (Fred), Angel Decker (Lonnie) and Gabriela Martinez. Nieces and nephews; Jorge Luis Garcia (Claudia), Christina Ryan, Angel DeGrasse (Steve), Deidra Murphy (Joe), Rocki Garcia (JR), Crystal Crosby (Chris), Rudy Lopez, Roxanna Garza (Enrique), Rebecca De Roman (Hugo), Juanita Teodoupe (Dustin), Katrina Stork, Loni Decker, Samantha Martinez and Ariana Martinez, Heather Orr, Jacob Fraley, Jebediah Fraley, Randy Bernal, Ben Bernal, Alex Bernal and Audrey Bernal. Great Nieces and Nephews; Daniel Ryan, Luis Gustavo Garcia, Luciano Garcia, Carlos Garcia, Nena Garza, Roxanita Quintanilla, Rikki Rojas, Isaiah DeGrasse (Bella), Mackenzie DeGrasse, Lance Capozella, Glenn Capozella, Jacob Capozella, Jessica Murphy, Kerri Murphy, Morgan Garcia, Chance Garcia, Lily Garcia, Hannah Crosby, Soli Decker, Braelynn Stork, Vashti Garcia, Fernando Garcia, Inaki Garcia. Great Great Nieces; Emma and Nicole Ryan, Camryn and Taryn Garcia. A celebration of life will be held at Wheatland Christian Church in Wheatland, IN on February 16 at 1:30 pm with Pastor Brent Cramer officiating. Fredrick and Son McClure-Utt Funeral Home, Vincennes Chapel is honored to assist in the arrangements of Mr. Gustavo Garcia. Online condolences may be made at www.fredrickandson.com.